You see, we already started collecting Minions even before this package was sent over to our address. When she found out that the box contained the complete set, she was really excited to open all 10. "Mommy, please... can we open it now." How can I say "No" to those pleading eyes? 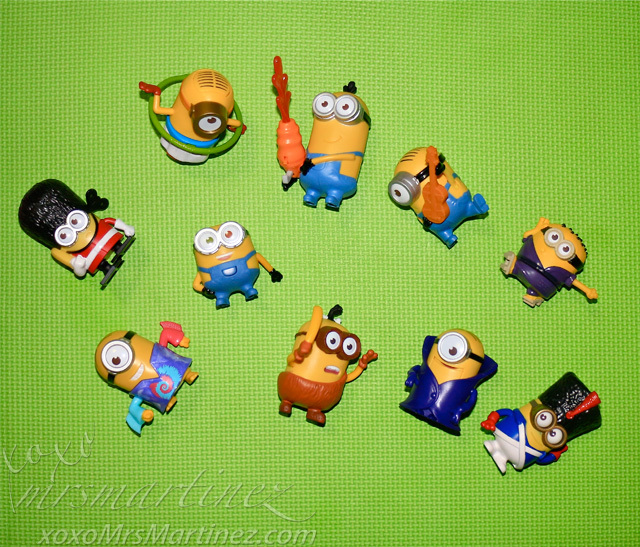 Meet the Minions: Martial Arts Minion, Groovy Stuart, Lava Shooting Kevin, Guitar Strumming Stuart, Minion Vampire, Guard Minion, Minion Caveman, Marching Minion Soldier, Egyptian Hula Minion and Chatting Bob. A full Minion experience awaits as McDonald's brings us the Minions Banana Festival. You can go bananas with new Minions Happy Meal toys- 10 Minions collectibles now available in-store- and the Minions combos featuring and array of Minions-themed desserts. Enjoy new cold treats that you and our favorite yellow friends will surely love! Try the NEW Minions Medium Fries ‘N McFloat Combo with the Honey Banana McFloat and our World Famous Fries for only Php 65! Also try the Minions Medium Fries 'N McFlurry combo with the NEW Banana Crumble McFlurry or Banana McFlurry with Oreo for only Php 95! If you are with friends, grab and enjoy the Minions BFF Fries 'N McFloat Combo (Php 165) or the Minions BFF Fries 'N McFlurry Combo (Php 225). Oh, McDonald's is also introducing the Minions Banana McDip, a delicious vanilla soft serve covered in banana-flavored dip on a blue wafer cone for only Php 15. Minions Happy Meal and limited-edition menu offers are all available in McDonald's stores nationwide. Incidentally, Minions Movie is now showing in theaters near you. You can now watch Kevin, Stuart and Bob come to life on the big screen! Share your love for the Minions at McDonald's via the official McDo PH Facebook fan page, by tagging @McDo_PH to your tweet or by using #MinionsAtMcDo on Instagram.